Thank you in advance for any help and any input. I have a 2002 grand cherokee 4.7l 4wd limited that i bought. I bought it not running thinking it would be an easy fix. The jeep looks great inside and out which was the main factor. The guy said it had no spark and that it was running before he did a bunch of stuff to it to get it ready for his son. New brakes, new water pump, new gaskets on oil pan, machined the heads, new fuel pump he had reciepts for the whole thing. I get it home and look into it here is what i find. It has spark it has injector pulse, the fuel pump primes and had 45psi at the rail during cranking, i inspected the wiring for frayes or broken wires none found. I did find a ground by the passenger side exhaust that was broken fixed that, put in a new crank sensor and tested the old one but they both tested good. I ordered a new mopar crank sensor. Thinking the autozone sensor could be defective even though it tested good. The ASD i also checked and the relay works and if it was the ASD i wouldnt be having a spark or injector pulse right? And the SkIM is ok to i do not have the key with a line through it light on while its cranking. When it cranks it had a little pop to it so i thought maybe the timing was off. I disasembled the front cover and it looked good ordered a new chain and sproket set, and when i removed the old chain i realized the driver side sprocket was put in improerly. 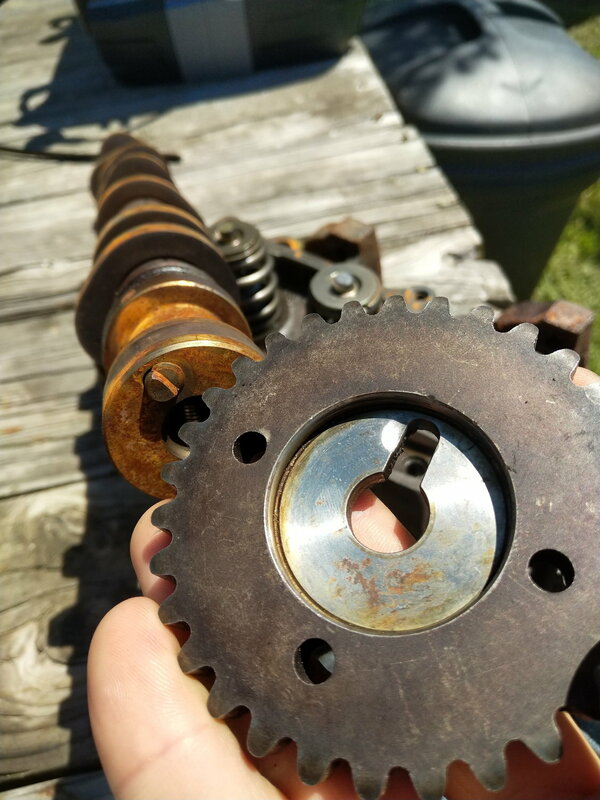 The dowel pin on the camshaft was not lined up with the opening on the sprocket ill include a picture of that. So i got another cam and redid the timing on it and turned the engine by hand to check no interferance felt good. Put it all together and still no start. Compression i have 135 dry in all cylinders and 145-150 wet. I also checked connectiins at the pcm. And it has a new battery charged and less than a month old. Also the TCM relay gets warmer than i have felt any relay get while it is turning over i tried swapping relays and the same thing happens. I am stumped at this point and not sure what else to check. Ill update when i install the new mopar crank sensor. Thanks again for any input and comments. Heres the original cam with the dowel broken and back side of old sproket were you can see they forced it on there.